The Spiritual World of God’s Eternal Kingdom exists beyond what you can see with your human eye sight, yet because the Father’s greatest desire is to bring you into his presence he offers you his eyes so you can see the path you must follow. As you begin to look through the Father’s eye’s they will only focus on my life but on everything else however, the Father wants you to have eyes only for me. Then once you focus on my life, I will then give you my hands so you can feel the great need for all people to see with eyes of the Father. With the eyes of the Father His Eternal Kingdom will come into focus and you’ll begin to discover all the things the Father wants to give you, things both for here and now and for eternity. 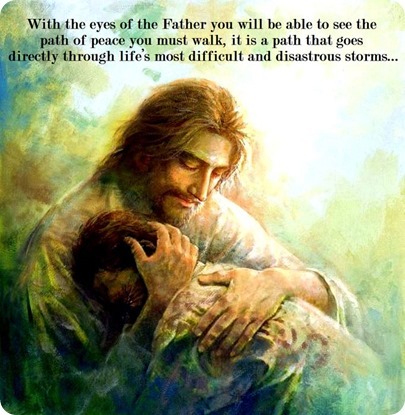 With the eyes of the Father you will be able to see the path of peace you must walk, it is a path that goes directly through life’s most difficult and disastrous storms and as you do you will never lose sight of the Holy Spirit as he goes before you laying the stepping stones of peace for you to step on. With the eyes of the Father you will see a City sitting on hill, a beautiful City of Light, of Peace, of Joy, of Hope, of Love, of Faith it is the City of God wherein you will take your place reserved for you from the beginning to time. Come with your arms open wide and do not take lightly the Father’s desire to give you his eyes because those who accept his gift of sight will receive not only life but the Father as well but for those who do not accept his gift of sight the day will come when they will be forever sightless. Please do not be among them!